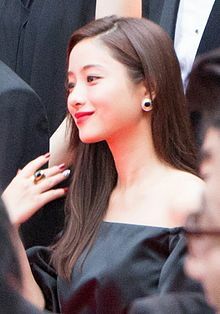 Kuniko Ishigami (石神 国子, Ishigami Kuniko, born December 24, 1986), better known by her stage name Satomi Ishihara (石原 さとみ, Ishihara Satomi), is a Japanese actress from Tokyo. Satomi Ishihara was born 1986 on December 24. Her agency is HoriPro. ^ "石原さとみ" [Ishihara Satomi Horipro official website] (in Japanese). HoriPro Inc. Retrieved 2015-04-05. ^ "石原さとみ" [Ishihara Satomi's profile] (in Japanese). eiga.com inc. Retrieved 2015-04-05. ^ "「窓を開けたら」石原さとみ主演・一青窈「音木箱」主題歌". Columbia Music Entertainment (in Japanese). Retrieved 2018-05-17. ^ "Kimi wa Petto". JDorama.com. Retrieved 2015-05-14. ^ "TV きみはペット - allcinema". allcinema (in Japanese). Stingray. Retrieved 2015-05-14. ^ "Teru Teru Kazoku". JDorama.com. Retrieved 2015-05-14. ^ "天国への応援歌 チアーズ～チアリーディングに懸けた青春～" (in Japanese). Nippon Television Network Corporation. Retrieved 2015-05-14. ^ "TBS「水曜プレミア ビー・バップ・ハイスクール」" (in Japanese). Tokyo Broadcasting System Television, Inc. Retrieved 2015-05-14. ^ "Water Boys 2". JDorama.com. Retrieved 2015-05-14. ^ "Yoshitsune". JDorama.com. Retrieved 2015-05-14. ^ "義経". allcinema (in Japanese). Stingray. Retrieved 2015-05-14. ^ "H2 - Kimi to itahibi". JDorama.com. Retrieved 2015-05-14. ^ "Akai Giwaku". JDorama.com. Retrieved 2015-05-14. ^ "怪談スペシャル" (in Japanese). Fuji Television Network, Inc. Archived from the original on 2005-12-20. Retrieved 2015-05-14. ^ "ビー・バップ・ハイスクール" (in Japanese). Tokyo Broadcasting System Television, Inc. Retrieved 2015-05-14. ^ "ドラマ「クライマーズ・ハイ」" (in Japanese). NHK. Retrieved 2015-05-14. ^ "Ns'あおい" (in Japanese). Fuji Television Network, Inc. Retrieved 2015-05-14. ^ "Ns' Aoi". JDrama.com. Retrieved 2015-05-14. ^ "手の上のシャボン玉" (in Japanese). Nippon Television Network Corporation. Retrieved 2015-05-14. ^ "Ns'あおいスペシャル". allcinema (in Japanese). Stingray. Retrieved 2015-05-14. ^ "テレビ朝日 氷点" (in Japanese). TV Asahi Corporation. Archived from the original on 2007-03-23. Retrieved 2015-05-14. ^ "翼の折れた天使たち" (in Japanese). Fuji Television Network, Inc. Retrieved 2015-05-14. ^ "花嫁とパパ" (in Japanese). Fuji Television Network, Inc. Retrieved 2015-05-14. ^ "世にも奇妙な物語 秋の特別編". allcinema (in Japanese). Stingray. Retrieved 2015-05-14. ^ "恋のから騒ぎ ドラマスペシャル ～LOVE STORIES～ IV". allcinema (in Japanese). Stingray. Retrieved 2015-05-14. ^ "まるまる ちびまる子ちゃん 第26話" (in Japanese). Fuji Television Network, Inc. Retrieved 2015-05-14. ^ "鹿鳴館" (in Japanese). TV Asahi Corporation. Retrieved 2015-05-14. ^ "朝日放送 パズル" (in Japanese). TV Asahi Corporation. Retrieved 2015-05-14. ^ "ドラマ24「ウォーキン バタフライ」" (in Japanese). TV Tokyo. Retrieved 2015-05-14. ^ "長生き競争!" (in Japanese). Fuji Television Network, Inc. Retrieved 2015-05-14. ^ "ヴォイス～命なき者の声～" (in Japanese). Fuji Television Network, Inc. Retrieved 2015-05-14. ^ "TBS ドラマ 『 こちら葛飾区亀有公園前派出所 』" (in Japanese). Tokyo Broadcasting System Television, Inc. Retrieved 2015-05-14. ^ "左目探偵EYE" (in Japanese). Nippon Television Network Corporation. Retrieved 2015-05-14. 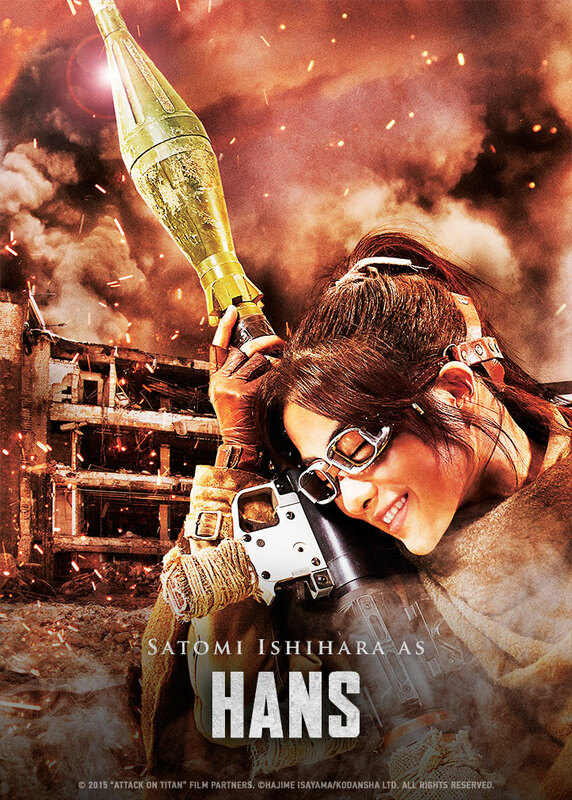 ^ "裸の大将 火の国・熊本篇～女心が噴火するので～" (in Japanese). Fuji Television Network, Inc. Retrieved 2015-05-14. ^ "石原さとみがオジサンに!? ドラマ「椿山課長の七日間」制作発表" (in Japanese). Kadokawa Corporation. Retrieved 2015-05-14. ^ "NHKオンデマンド 古代史ドラマスペシャル 大仏開眼" (in Japanese). NHK. Retrieved 2015-05-14. ^ "逃亡弁護士" (in Japanese). Fuji Television Network, Inc. Retrieved 2015-05-14. ^ "石原さとみがインチキ霊能力者に! 10月クールの新ドラマで谷原章介と"迷"コンビを結成!?" (in Japanese). Kadokawa Corporation. Retrieved 2015-05-14. ^ "スペシャルドラマ 坂の上の雲" (in Japanese). NHK. Archived from the original on 2015-05-12. Retrieved 2015-05-14. ^ "ブルドクター" (in Japanese). Nippon Television Network Corporation. Retrieved 2015-05-14. ^ "NHK土曜ドラマスペシャル" (in Japanese). Archived from the original on 2011-11-07. Retrieved 2015-05-14. ^ "蛇蝎のごとく" (in Japanese). TV Tokyo. Retrieved 2015-05-14. ^ "リッチマン、プアウーマン" (in Japanese). Fuji Television Network, Inc. Retrieved 2015-05-14. ^ "ラッキーセブン" (in Japanese). Fuji Television Network, Inc. Retrieved 2015-05-14. ^ "リッチマン、プアウーマンinニューヨーク" (in Japanese). Fuji Television Network, Inc. Retrieved 2015-05-14. ^ "土曜スペシャル・世にも奇妙な物語'13秋の特別編" (in Japanese). Fuji Television Network, Inc. Retrieved 2015-05-14. ^ "月曜ゴールデン特別企画『恋』" (in Japanese). Tokyo Broadcasting System Television, Inc. Retrieved 2015-05-14. ^ "新春ドラマスペシャル"新参者"加賀恭一郎「眠りの森」" (in Japanese). Tokyo Broadcasting System Television, Inc. Retrieved 2015-05-14. ^ "失恋ショコラティエ" (in Japanese). Fuji Television Network, Inc. Retrieved 2015-05-14. ^ "ほんとにあった怖い話" (in Japanese). Fuji Television Network, Inc. Retrieved 2015-05-14. ^ "ディア・シスター" (in Japanese). Fuji Television Network, Inc. Retrieved 2015-05-14. ^ "TV 5→9 ～私に恋したお坊さん～". allcinema (in Japanese). Stingray. Retrieved 2015-10-12. ^ "TV 地味にスゴイ！校閲ガール・河野悦子". allcinema (in Japanese). Stingray. Retrieved 2016-11-30. ^ "アンナチュラル" (in Japanese). TBS Television. Retrieved July 16, 2018. ^ "高嶺の花 日本テレビ" (in Japanese). Nippon TV. Retrieved July 16, 2018. ^ "わたしのグランパ Official website" (in Japanese). My Grandpa Production Committee. Retrieved 2015-05-14. ^ "すべり台" (in Japanese). eiga.com inc. Retrieved 2015-05-14. ^ "北の零年 Official website". kitano-zeronen.jp (in Japanese). Archived from the original on 2015-05-23. Retrieved 2015-05-14. ^ "『包帯クラブ』柳楽優弥、石原さとみ、田中圭、関めぐみ、佐藤千亜妃 単独インタビュー" (in Japanese). Cinematoday Inc. Retrieved 2015-05-14. ^ "銀幕版スシ王子! ニューヨークへ行く" (in Japanese). Kadokawa Corporations. Retrieved 2015-05-14. ^ "『フライング☆ラビッツ』石原さとみ＆真木よう子 単独インタビュー" (in Japanese). Cinematoday Inc. Retrieved 2015-05-14. ^ "「幸せです・・・」生田斗真、初主演映画『人間失格』公開前夜祭で感激の男泣き" (in Japanese). oricon ME inc. Retrieved 2015-05-14. ^ "座頭市 The Last" (in Japanese). Kadokawa Corporation. Retrieved 2015-05-14. ^ "映画「インシテミル7日間のデス・ゲーム」公式サイト" [Official website] (in Japanese). The Incite Mill Production Committee. Retrieved 2015-05-14. ^ "どうして俺は嫌われる?!" [Official website]. manzaigang.jp (in Japanese). Retrieved 2015-05-14. ^ "月光ノ仮面 Official website". gekkonokamen.com (in Japanese). Archived from the original on 2011-12-13. Retrieved 2015-05-14. ^ "映画『貞子3D2』公式サイト". sadako3d.jp (in Japanese). Retrieved 2015-05-14. ^ "BUNGO ささやかな欲望 見つめられる淑女たち編" (in Japanese). Kadokawa Corporation. Retrieved 2015-05-14. ^ "映画『カラスの親指』公式サイト" (in Japanese). Karasu no Oyayubi Film Partners. Retrieved 2015-05-14. ^ "映画『Monsterz モンスターズ』公式サイト" [Official website] (in Japanese). Monsters Film Partners. Retrieved 2015-05-14. ^ "映画「幕末高校生」" (in Japanese). Bakumatsu Kōkousei Production Committee. Retrieved 2015-05-14. ^ "映画『風に立つライオン』公式サイト" (in Japanese). Kaze ni Tatsu Lion Production Committee. Retrieved 2015-05-14. ^ "映画『進撃の巨人』公式サイト" [Official website] (in Japanese). Attack on Titan Production Committee. Retrieved 2015-09-09. ^ "New Japanese Godzilla Film Unveils Cast, Title". Anime News Network. Retrieved September 22, 2015. ^ "映画『忍びの国』公式サイト". shinobinokuni.jp (in Japanese). Retrieved 6 December 2016. ^ "濱田岳、妻夫木聡、竹内結子、石原さとみ！「決算！忠臣蔵」に超豪華キャスト続々" (in Japanese). Retrieved 6 March 2019. ^ "Winners of "VOGUE NIPPON Women of the Year 2010"". tokyohive. 6Theory Media, LLC. Retrieved 2015-04-08. ^ "Toyota, Yonekura, Ishihara & Kutsuna get awarded for their beautiful legs". tokyohive. 6Theory Media, LLC. Retrieved 2015-04-08. ^ "Ishihara Satomi and Iura Arata receive 'Best Formalist' award". tokyohive. 6Theory Media, LLC. Retrieved 2015-04-08. ^ "The "Independent Critics" List 100 Most Beautiful Faces of 2013". TC Candler. Retrieved 2015-04-08. ^ "AKB48 receives 'Best Dressed Eyes Awards' for the 2nd time". tokyohive. 6Theory Media, LLC. Retrieved 2015-04-08. ^ "100 Most Beautiful Faces 2014". TC Candler. Retrieved 2015-04-08. ^ "今年、Yahoo!で最も検索されたのは「羽生結弦」さん　「Yahoo!検索大賞2014」発表" (in Japanese). Zaikei Shimbun. Retrieved 2015-04-08. ^ "報知映画賞 歴代受賞一覧" [Hochi film award successive winners] (in Japanese). Retrieved 2015-04-08. ^ "歴代受賞者と受賞作品" [successive winners and titles] (in Japanese). Nikkan Sports News. Retrieved 2015-04-08. ^ "46th Blue Ribbon Awards". allcinema (in Japanese). Retrieved 2015-04-08. ^ "Japan Movie Critics Award 2000-2009" (in Japanese). Japan Movie Critics Award. Retrieved 2015-04-08. ^ "27th Japan Academy Prize" (in Japanese). Japan Academy Prize Association. Retrieved 2015-04-08. ^ "Golden Arrow Award Successive Winner" (PDF) (in Japanese). Japan Magazine Publishers Association. Retrieved 2015-04-08. ^ "第25回ヨコハマ映画祭 日本映画個人賞" [25th Yokohama Film Festival] (in Japanese). Archived from the original on 2004-05-05. Retrieved 2015-04-08. ^ "Élan d'Or successive winners list" (in Japanese). All Nippon Producers Association. Retrieved 2015-04-08. ^ "29th Japan Academy Prize" (in Japanese). Japan Academy Prize Association. Retrieved 2015-04-08. ^ "International Drama Festival:TOKYO DRAMA AWARDS" (in Japanese). International Drama Festival in Tokyo. Retrieved 2015-04-08. ^ "The 87th Drama Academy Awards (Autumn 2015) - Best Leading Actress". Dorama World. Retrieved 2016-11-30. This page was last edited on 6 March 2019, at 00:21 (UTC).